I think we all tend to think that happiness comes from perfection. I know I thought so. 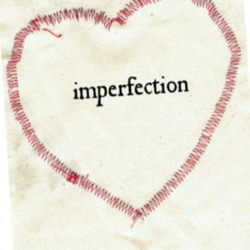 But, I realize now that true happiness comes from the acceptance of non-perfection. It comes from recognizing and truly accepting the fact that I don’t really have a clue. I am just wading through life doing the best I can and trying to make every day the best one possible. This profound realization, which was really not sudden since I have been “getting it” for the past ten years, is very liberating. It releases me from many of the mental chains I have been dragging around most of my life. The kind of chains that stop me from being spontaneous or living my life to the fullest. I think I am finally getting somewhere. I hope this piece helps you to realize that you are not perfect either. None of us are. And honestly, who would want to live in a world where everyone was perfect. Think of how boring that would be. Sara Morgan is a professional web developer and the author of No Limits: How I escaped the clutches of Corporate America to live the self-employed life of my dreams”. You can find out more about Sara and her book at http://www.nolimitsthebook.com.